Map of Kampala showing the location of Bukabika. 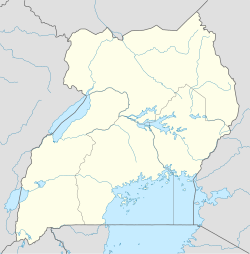 Butabika is a location in south-eastern Kampala, the capital city of Uganda. Butabika is bordered by Bweyogerere to the north, Kirinnya, a Ward in Kira Municipality to the east, Luzira and Port Bell to the south, Mutungo to the west and Kireka in Kira Municipality to the northwest. This location is approximately 12 kilometres (7.5 mi), by road, east of Kampala's central business district. The coordinates of Butabika are:0°19'12.0"N, 32°39'27.0"E (Latitude:0.3200; Longitude:32.6575). Butabika lies approximately 1,180 metres (3,870 ft) above sea level. Butabika is the location of the largest mental health hospital in Uganda, with an estimated bed capacity of 900. Butabika National Referral Hospital is the country's only referral hospital specializing in mental health. Prior to 2005, the hospital owned the entire area consisting of over 300 acres (120 ha). In 2005, about half of that land was sold to private individuals and institutional developers. One of those developers is Nationwide Properties, a subsidiary of Mukwano Group. Nationwide constructed a housing estate of 1,400 upscale housing units on 150 acres (61 ha) of prime land, adjacent to Lake Victoria, slated for completion in 2011. Butabika National Referral Hospital - The largest mental health facility in Uganda and the only national mental health referral hospital in the country, admitting in excess of 6,000 mental health patients annually. The Institute of Clinical Psychiatric Officers (ICPO) - A Uganda Government-owned school that trains Clinical Psychiatric Officers, administered by the Uganda Ministry of Health. Biina Catholic Cathedral - A place of worship affiliated with the Catholic Church. Royal Palms Housing Estate - An upscale private real estate development by the Mukwano Group of Companies. ^ "Map Showing Central Kampala And Butabika with Distance Indicator". Globefeed.com. Retrieved 13 June 2014. ^ Google, . "Location of Butabika At Google Maps". Google Maps. Retrieved 13 June 2014. ^ Nuwagaba, Edwin (4 February 2010). "A Touch of Elegance at Royal Palms Estate". Daily Monitor. Retrieved 13 June 2013. ^ Odomel, James (26 March 2009). "83 Units Ready at Royal Palm". New Vision. Archived from the original on 19 January 2014. Retrieved 13 June 2014. ^ Lydia Lakwonyero, and Simon Longoli (8 June 2009). "Uganda Lacks Psychiatrists". New Vision. Archived from the original on 14 July 2014. Retrieved 13 June 2014. ^ Odomel, James (1 May 2008). "Butabika To Get Sh255 Billion Housing Estate". New Vision. Archived from the original on 3 May 2008. Retrieved 13 June 2014. This page was last edited on 14 May 2018, at 14:16 (UTC).